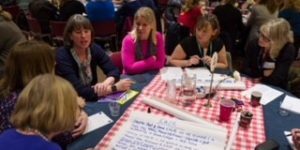 For the last five years Oxfordshire Family Support Network (OxFSN) has held a large information fair at the Kassam Stadium Conference & Events Centre. This year instead of the Fair we held a ‘Moving into Adulthood’ (Transition) event specifically for families of disabled young people and the professionals who work with them. Planning for the future with young disabled people can be a stressful time for families. To add to this we are currently in a time of major changes in all services, with new legislation and policies. This event provided an opportunity for parents and professionals to hear about these changes and what they mean for young people moving into adult life and their families. In the breaks there were opportunities to visit the exhibition, with stall holders from a range of different organisations and service providers.